This week I have been thinking a lot about dialogue. As well as having been reading Leading from the Future – From Ego-System to Eco-System Economics I have also been putting the finishing touches to my slides on a new workshop on Dialogue, and came across some very wonderful works by artist Laura Tetrault who has a blog London Art Girl. Laura has graciously given me permission to use her painting titled Conversation for the cover of my slides, which you can see below. When I first spied these women in my local coffee shop I thought “these girls are having an after yoga coffee”. I didn’t overhear any of their conversation but as I sketched and thought about it more I imagined that maybe these girls get together every week to connect, to be just Jane instead of Tommy’s mommy, Rick’s wife and Janice’s boss. It is amazing how easy it is to lose your identity in what you do and who is connected to you. That’s why friends are so great. Because you have always been “just Jane” to them, and you will always be Jane first no matter how many diverse roles or hangers-on you acquire. I absolutely love this painting, and for me it is one of the greatest captures of one of the most simple but delightful moments in life, catching up with friends where you can let go of ego and just lose yourself in conversation, allowing it to go freely wherever it wants, with no direction and no hidden agendas. The women in the painting are free to speak from their hearts, having built up a trusting and close relationship perhaps over a number of years. Power and organisation are modelled in the following manner, showing the path from centralised power, to decentralised, networked, and then radically inverted, which is where the evolution from ego to eco occurs. Although of course in a 3.0 economy there are many advantages to having decentralised and networked power structures. But as we have seen in the Uk this week with the collapse in authority of the Labour party leadership in light of the politicking of the union Unite, these types of structure are open to abuse by special interest groups. Here in Brazil following monumental social unrest and mass demonstrations on the streets, many politicians are using the word dialogue in all their pronouncements, but I feel that this may be a very different use of the word dialogue to the one I have in mind, which is inspired by the work of David Bohm. As Scharmer and Kaufner say, the blind spot in the twentieth-century toolkit of economics and management can be summarised in a single word: consciousness. Without an adequately developed level of mindful awareness and consciousness, dialogue will never be able to be truly nurtured, since we are caught in the traps of our own egos. The group’s attention level goes up five notches. The amount of internet talk, within each person, goes down, and that reduces the “noise in the system”. People often don’t know who is talking. It makes them realise how much they judge the credibility of a statement according to who is speaking. Shared meaning is really the cement that holds society together, and you could say that the present society has very poor quality cement. The thing which mostly gets in the way of dialogue is holding to assumptions and opinions, and defending them. When one human being tells another human being what is ‘real’ what they are actually doing is making a demand for obedience. They are asserting that they have a priviledged view of reality. In genuine dialogue each person is participating, is partaking of the whole meaning of the group and also taking part in it. I am not too sure exactly when I will be running my first dialogue sessions, but I know that they will be extremely powerful. Here in Brazil I have already had the honour to taken quite a few people on a learning journey through complexity, helping them to understand the non-linear world we live in, a world where complexity and chaos can be embraced as live-giving and sustainable qualities. I am also working on developing a further workshop on Redesigning for Resilience, along with my colleagues at Biomimicry for Creative Innovation, helping people to understand how they can develop businesses inspired by nature. 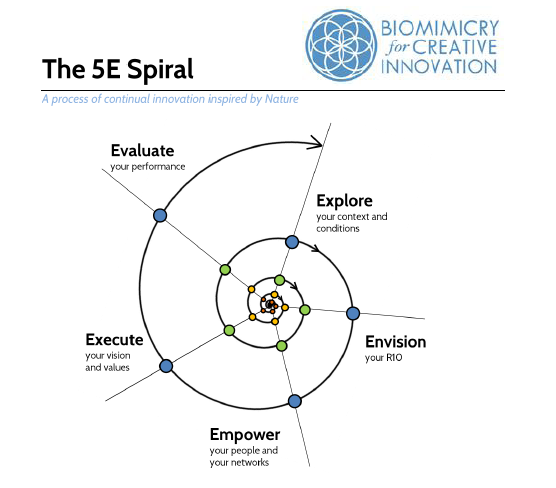 In these workshops we take people on a journey through a number of processes such as the 5E one shown below, which are all based on iterative spirals. We work together best when we have true dialogue. I can strongly recommend Leading from the Emerging Future, it has a huge amount of practical advice as well as inspiration for how we can enter into this deeper consciousness, deeper awareness and deeper levels of dialogue we so greatly need all around the world right now. And I hope you also enjoy the work of Laura too. I always look for inspiration for every place I can, and I thank her for allowing me to share her wonderful work with you. I am coming back to read this again and again. Breathless expressions.